World justice project incubator is a platform to use rule of law and working using theory of change. This is as part of the systems class at the Design for Social Innovation. 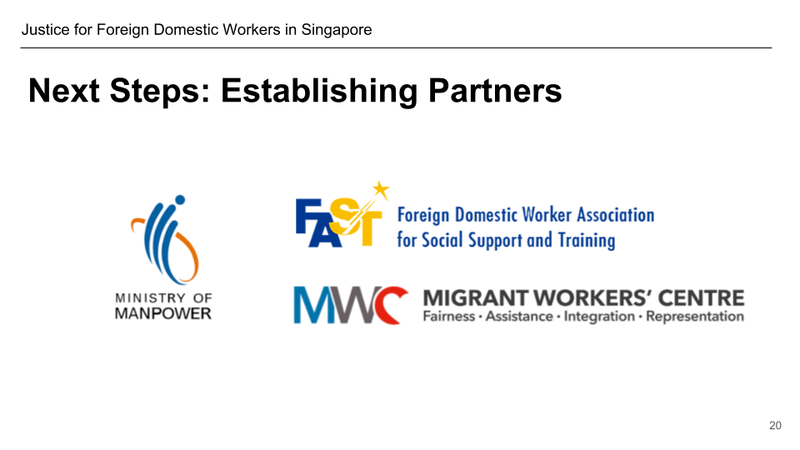 The current laws advocate for more mutuality and accountability between employers and Foreign Domestic workers (FDWs) in Singapore, but an innate inequality exists in power dynamics between these two groups perpetuates abuse against FDWs. The Rule of Law Index for Singapore is really high and has a global rank of 9, despite that, Singapore ranks low in Fundamental rights and Regulatory Enforcement. How might we address the unequal power dynamic between employers and FDWs to allow for effective regulatory enforcement of FDW right? By reforming the existing hiring process and designing an improved system for reporting, we can address an unbalanced power dynamic between employers and FDWs which will carry out a system of proper enforcement and action based on FDWs’ legal rights.